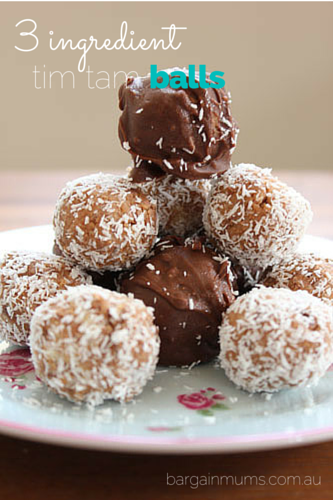 You only need 3 ingredients to make these Tim Tam Balls, and they are so easy to make. Just process the ingredients, roll into balls and coat in melted chocolate or coconut, and pop into the fridge to harden (if they make it that far). You can coat them in any type of chocolate, dark, milk or white, or coconut. I coated half of mine in milk chocolate and half in coconut, and I loved them coated in chocolate. You can make these using any packet of biscuits, you don’t have to use Tim Tams. A packet of Mint Slice biscuits would be the perfect alternative. Want to stay updated on all the latest sales and money saving ideas? Sign up to the Bargain Mums Mid-Week Catch Up email here.